The Indoor athletics season got under way in America and D.S.D. 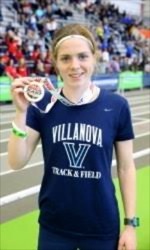 athlete Siofra Cleirigh Buttner (Villanova) was on the score sheet. Siofra ran her first race over 3,000m and finished a brilliant 3rd, at the Jack Pyrah Invitational, recording a time of 9.37.48 (PB). Meanwhile at home 17 year old Abbie Taylor ran an outstanding 9.36.02 (3,000m) at Abbotstown Indoor Arena. This is 20 seconds faster than she ran last year, to finish 2nd in the Senior race to Amy O’Donoghue. Great Run by Sophie in Slovakia!